← Corbynomics 101—It’s the Deficit, Stupid! As I explained in my previous posts (see here and here), there is no credit risk in obligations denominated in the domestic currency, that is, the risk of payments not being made on government debt denominated in Reais is zero. Why? Because Brazil’s local currency debt outstanding promise to pay Reais and the federal government is the monopoly issuer of currency (Rezende 2009). Question: What is the sovereign’s ability and willingness to its service financial obligations to nonofficial (commercial) creditors for a country that has more assets denominated in foreign currency than debt? The government can pay all of its obligations in foreign currency. This is interesting. The analyst said that international reserves are funds to pay the debt of the public AND the private sector. Really? Is she implying a bailout of private external debt? 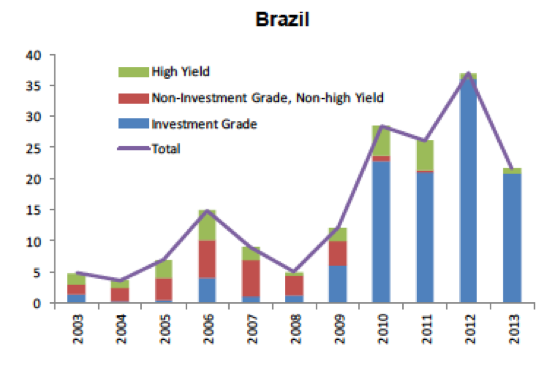 In my previous post, I showed that there was a sharp increase in private external debt issuance since Brazil’s upgrade to investment grade status (figure 1) and that there are significant risks associated with them when external conditions change. Brazil has seen large increases in private foreign currency-denominated debt, in particular for non-financial corporates and banks. This increase in external private debt has increased external financial fragility and exposed the private sector to refinancing risk and to increases in debt servicing costs. This is an important source of financial fragility, which can have potential impacts on economic activity. But, is she implying that the Brazilian government ought to give financial assistance to failing private businesses that cannot meet their obligations denominated in foreign currency debt? Brazil is a sovereign government. Contrary to the analyst view, international reserves are assets owned by the government. She should take a quick look a Brazil’s central bank (BCB) balance sheet to realize that international reserves are assets that the Brazilian government holds, mainly in the form of bonds issued by foreign governments (BCB’s discloses in its financial statements the allocation of international reserves, which includes items such as 4 – cash and cash equivalents in foreign currencies, 5.1. deposits in foreign currencies, 6 – funds under external management, 9.1. in foreign currencies, 12 – gold). So, the question should be: Is the federal government able to service its foreign currency debt on time and in full? The answer is yes. Why? Let us look at two alternative ways to measure the government external debt outstanding: one is a narrow view of the government including the federal, state and municipal governments and the other takes into account the narrow view plus quasi-sovereign debt, that is, external debt issued by state-owned financial institutions and enterprises including Brazil’s national development bank (BNDES), state-owned banks- Banco do Brasil (BB) and Caixa Econômica Federal (CAIXA), and Petrobras (table 1). Even if you consider quasi-foreign debt the federal government is still able to service its foreign currency debt on time and in full. However, S&P’s rating methodology, includes nonresident holdings of locally issued Brazilian real-denominated government, which as of June 2015 was equal to US$ 144,7 billion, according to central bank data. 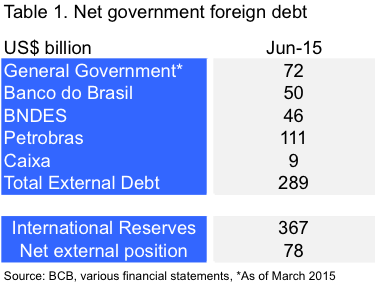 So, this mistaken estimate of government external debt generates a net negative position (Brazil’s net external position from table 1 minus nonresident holdings of locally issued Brazilian real-denominated government debt). External debt is a liability of a resident unit held by nonresidents, irrespective of the place of trading, the jurisdiction, or the currency in which the debt is denominated. So, even liabilities in national currency, issued in Brazil, must be part of the external debt. So, regarding the non-resident share in domestic federal public debt there is no solvency risk because the federal government is able to service its debt denominated in Reais on time and in full. Thus, there is no credit risk. As the S&P analyst confirmed there is no solvency issue. But S&P seems to be concerned with other risks such as exposure to foreign exchange risk by non-resident investments. That is, they are concerned that foreign exchange depreciation will generate carry trade losses for foreign investors. For instance, in a carry trade, an investor borrows funds (in U.S. dollars or other hard currencies) at a low interest rate to invest in high yield local currency assets (such as purchases of Brazilian bonds). Note that if the R$/US$ foreign exchange appreciates then investors earn the interest rate differential plus capital gains due to exchange rate appreciation. However, if the R$/US$ foreign exchange depreciates, then this strategy generate losses due to exchange rate depreciation, which can more than offset interest rate differentials and produce net losses for investors. This strategy carries its risks so investors decide whether they want to bear those risks. Though the carry trade strategy has generated big profits for investors in the past, it has also produced losses. 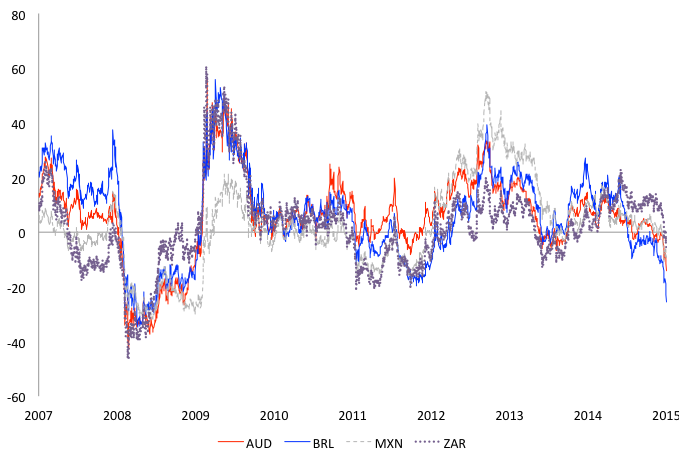 Figure 2 shows carry trade total returns for different current pairs including the Brazilian real (BRL). 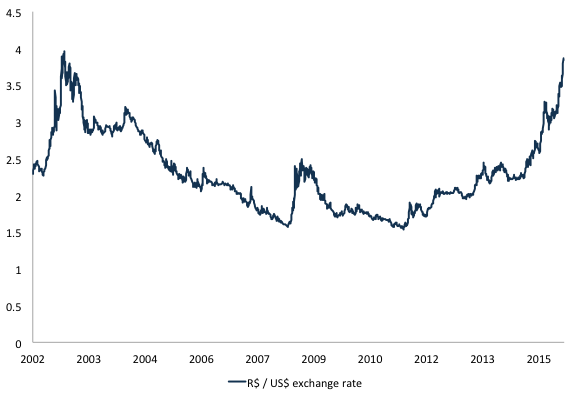 The massive depreciation of the Brazilian real against the US dollar (figure 3), in particular in 2015, triggered carry trade losses. However, the Brazilian government cannot be held responsible for them. To sum up, contrary to S&P’s analyst view, Brazil is a net external creditor. Can it make payments on and in full on foreign currency sovereign debt? The answer is yes. Moreover, Brazil cannot become insolvent on its own currency. Taxpayers (currency users) pay their taxes using the currency issued by the federal government (currency issuer). Because the government is the monopoly issuer of currency, it must spend first (by issuing its IOUs) so currency users can pay their taxes. Government bonds — interest-bearing IOUs — are issued to remove excess reserves so Brazil’s central bank can hit its positive overnight interest rate target. It is an interest rate maintenance operation rather than a borrowing operation (for further details see Rezende 2009). For a sovereign government that issues its own nonconvertible currency, the overnight interest rate target is a policy choice. The interest rate target set by the BCB is a policy variable. However, this policy choice has significant impacts on the composition of Brazil’s fiscal deficits, which in the Brazilian case, most of its fiscal deficit is due to interest payments — 6% of GDP on interest payments in 2014. As I argued in a previous post, Brazil’s positive economic performance prior to the economic crisis of 2007-2008 led to a unique economic environment conducive to Brazilian economic expansion and improvement in economic conditions for the majority of people. However, Brazil’s policy response to the crisis and the impacts of bursting bubble conditions that prevailed prior to the crisis that benefited emerging market economies have exposed the inherent contradictions of Rousseff’s policies, that is, an attempt to reclaim the pre-crisis progress and adherence to the mythology of neoliberal ideology that reasserted itself as soon as external economic conditions changed. The economic debate of the previous election cycle in Brazil caused the Rousseff administration’s economic policy to drift in a conservative neoliberal direction. The idea that Brazil faces a fiscal crisis and that austerity measures will pave the way for economic growth is incorrect. Brazil needs to frame the debate within the progressive space. Brazil is the monopoly issuer of currency, it can make all payments denominated in the state unit of account as they come due, that is, solvency is not an issue. As I have argued elsewhere, following fiscal rules blindly without determining the impacts on the private sector balance can be dangerous to growth and stability. Current policy is being built on a foundation of fantasy, based on myths that prevent us from adopting reasonable policies such as promoting an effective policy to achieve and maintain full employment and price stability. This entry was posted in Felipe C. Rezende and tagged Brazil, S&P. Bookmark the permalink. If there’s no solvency issue, then there’s no relevancy issue for S&P sovereign ratings. Politics & guessing. And, if ghosts don’t exist, there should be no fear of living in a haunted house. Welcome to Halloween. The S&P concern for FX changes is misplaced or misdirected, because USD using buyers, US buyers of Brazilian government bonds would (or should) isolate the yield from the FX by hedging in currency futures. That actually applies to the private sector Brazilian borrowers in USD also, they should simultaneously hedge in currency futures, and de-risk their debt service requirements. And S&P missed the boat on the FX risk any way, because they are already late. Not so say it can’t change more, but the change was visible in advance (because of commodity markets), and so they should have been warning much earlier. And so the entire case of S&P crumbles. Felipe has done a great job of clarified the matter. Tim Wards: Thanks. Unfortunately, most economists and policymakers in Brazil are still talking about solvency issues. It’s clear that Brazil doesn’t have a solvency problem and the author has done a great job in thoroughly debunking this S&P claim. However it would be even more important to refute the analysis held by 99.9% of Brazilian economists, pundits and likely politicians as well: that the country – quite apart from the “solvency” issue – needs austerity in order to: 1. Control and reverse inflation (currently running at an annual 9% rate) and 2. Prevent massive capital flight and the consequent (even greater than today’s) pressure on the Real. Is there an alternative economic model or theory that could be used to refute such claims and serve as the basis for an alternative policy based on increasing aggregate demand by raising investment expenditures and cutting taxes? If not, the country seems to be condemned to a long recession caused by austerity policies supported by 99% of opinion makers, both right and left.